Chomsky's brief account of the US selling arms to Iran via Israel in order to fund far-right paramilitary contras in Nicaragua. The major elements of the Iran/contra story were well known long before the 1986 exposures, apart from one fact: that the sale of arms to Iran via Israel and the illegal contra war run out of Colonel Oliver North's White House office were connected. The shipment of arms to Iran through Israel didn't begin in 1985, when the congressional inquiry and the special prosecutor pick up the story. It began almost immediately after the fall of the Shah in the Iranian Revolution of 1979. By 1982, it was public knowledge that Israel was providing a large part of the arms for Iran - you could read it on the front page of the New York Times. In February 1982, the main Israeli figures whose names later appeared in the Iran/contra hearings appeared on BBC television and described how they had helped organise an arms flow to the new Ayatollah Khomeini regime. In October 1982, the Israeli ambassador to the US stated publicly that Israel was sending arms to the Khomeini regime "with the cooperation of the United States... at almost the highest level." The high Israeli officials involved also gave the reasons: to establish links with elements of the military in Iran who might overthrow the regime, restoring the arrangements that prevailed under the Shah -- standard operating procedure. As for the contra war, the basic facts of the illegal North-CIA operations were known by 1985 (over a year before the story broke, when a US supply plane was shot down and a US agent, Eugene Hasenfus, was captured). The media simply chose to look the other way. 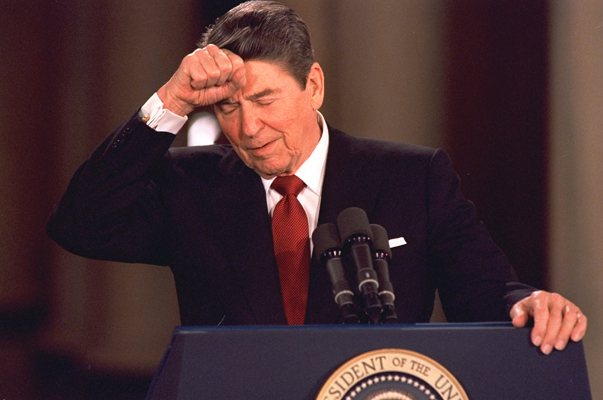 So what finally generated the Iran/contra scandal? A moment came when it was just impossible to suppress it any longer. When Hasenfus was shot down in Nicaragua while flying arms to the contras for the CIA, and the Lebanese press reported that the US National Security Adviser was handing out Bibles and chocolate cakes in Teheran, the story just couldn't be kept under wraps. After that, the connection between the two well-known stories emerged. "The speculation [that the US has sold arms to Iran] has no foundation."